Welcome to the Alaska Department of Fish and Game’s Trail Camera Gallery. These images were all taken by remote, motion-triggered cameras. Some images have been contributed by scientists and others by the public. 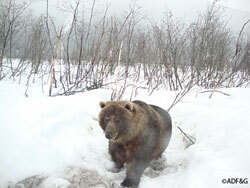 For more information on trail cameras, see the Alaska Wildlife News Trail Cameras article. ADF&G invites the public to submit images for display in this online gallery. The gallery offers a way to share images. Photographers retain all rights to their pictures. Send images and information to Riley Woodford at riley.woodford@alaska.gov. For questions, e-mail Riley or call 907-465-4256.